You may have several triggers to investigate the feasibility of moving a workload or set of workloads to the IBM® System z® platform. These triggers could be concerns about operational cost, manageability, or delivering the agreed service levels, among others. Investigating the feasibility of a possible migration or transition to any other platform, including System z, requires a number of basic steps. These steps usually start with an understanding of the current workload and its pain points, and end with a business case to move the workload. It is important to find out how easy a migration is going to be and how much risk will be involved. In this IBM Redbooks® publication we offer thoughts on how to move through these steps. 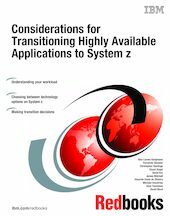 We also include a chapter with a System z technology summary to help you understand how a migrated workload may fit on the platform. Our focus in this book is on workloads that are mission-critical and require a high level of availability, including disaster recovery.